Phonologically, FLEECE has the same end-point as FACE, PRICE and CHOICE. Insisting on ɪ as the end-point of the latter three effectively makes the false claim that languages can make a distinction between diphthongs which end in ɪ and diphthongs which end in i̯/j. So how did this extensive and distinctive use of lax ɪ in RP arise? In Accents of English (p. 212) John Wells suggested that the laxing of the first element in the NEAR diphthong was a “British prestige innovation”, one of a set of innovations which came to characterize the elite accent RP. I suspect that this may have been true of all three RP uses of lax ɪ described above. Regarding happY, however, John took an RP-centric point of view and stated the question backwards (p. 258): “Where and when the [i] pronunciation arose is not certain. It has probably been in provincial and vulgar speech for centuries.” I suspect that it had been around everywhere. I suspect that it was RP’s lax ɪ which “arose”, and for reasons which John’s quote suggests: as a British prestige innovation, to make speakers sound different from the “provincial and vulgar”. which to me sounds like pure Manchester (not that there’s anything wrong with pure Manchester). Whatever the historical sources were for RP’s distinctive lax ɪ in these three positions, the end result was that in classic RP the tense quality i was restricted to Wells’s FLEECE set. Infants acquiring RP learned to pronounce all other close-front vowels as lax. Today, actors sometimes tell me that they need RP, perhaps for a Noel Coward play. Any actor who wants to assume a genuine, classic RP accent should really master these particular patterns of RP i-laxing. 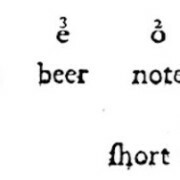 What I notice most about the 1930s beer in the first clip is that the second part of the diphthong sounds fairly open and long. Also it sounds to me like there is some creaky voice going on there. P.S. Thanks for posting again. I’ve missed reading these. Thanks for the thanks! Yes, in classic RP the first element of NEAR was lax and short, and the second element could become correspondingly much longer. In fact, Daniel Jones gives alternatives like njəː for near and hjəː for here – not for beer, however. Jones and Gimson also allowed that the second element could be opener. All these RP variants were displaced by a NEAR with a first part more like long-tense FLEECE, followed by a definitely short ə, creating something much more like a stressed-unstressed disyllabic sequence (see the following post). I added a note about RP’s male creak/fry before I saw your perceptive comment. As I discussed in an earlier post, this is more associated with younger, female speakers in today’s speech. Do you think you ever heard a pronunciation such as [njə̆ɜ̯ː] as a realization of /nɪə/. Or perhaps I should’ve written /njɜː/, I’m not sure. Certainly, in old films. I don’t have a njəː to hand, but here are two instances of the word here – the first strongly accented, the second less so, but both transcribable as hjəː. I wish I could find a clip with an example, just to determine what it sounds like in reality. Great posting, as usual. So, how do you suggest that happY should be transcribed? ɪj, ij, i, j? Glad you like it. If I’m transcribing the RP of Daniel Jones or John Wells, or a Manchester accent, I’d use the same vowel as KIT, ɪ. The kind of BrE heard most from newsreaders today has the FLEECE vowel, for which I prefer ɪj or ɪʲ. The j shows that there’s a falling diphthong and it encourages appropriate linking to the following vowel. Alternatively I don’t mind ij or iʲ. There’s no doubt that this vowel is often short in unstressed medial position, but a transcription like badlɪj ɔf for badly-off seems okay to me. Geoff, you mention three positions the KIT vowel occurs in. What about a fourth one? The vowel can also appear in unstressed right-hand open syllables which are not necessarily final, e.g. happiness, chimneysweep.